Dental crowns and bridges are types of restorations that are meant to repair teeth or replenish them entirely. Crowns (also sometimes referred to as “caps”) are securely cemented onto what remains of the dental structure, covering everything that appears above the gum line. Crowns can be crafted from several different types of materials, such as traditional metal, porcelain, and even PFM (porcelain fused to metal). Dr. Bancroft recommends porcelain whenever possible for a superior aesthetic benefit, but our team will do what is best for the patient’s needs and preferences. In most cases, dental crowns can be completed in just two appointments. After capturing impressions and shaping the tooth to support the new dental crown, a temporary crown will be placed over the structure. Then, once the lab returns the permanent crown to our dental office, a strong adhesive will be used to securely apply it in place. 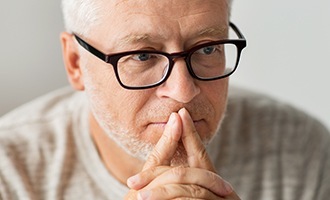 Other dental restorations may be feasible options as well, depending on the specific issues you’re facing and the severity of your dental damage. Bridges, inlays, and onlays are also available to restore dental structure. Dr. Bancroft will always take the time to create beautifully personalized and highly durable smile additions that bring life back to your teeth. When a single tooth or multiple teeth that used to appear in a row together have been fully lost, a dental bridge can repair this missing structure sturdily. Traditionally, the bridge itself fits within the gap and is anchored in place through the use of dental crowns, which are used to cover adjacent natural teeth. However, in today’s world, dental implants are a superior method for keeping bridges secure within your smile, as they don’t require any negative alteration of the natural teeth and will last longer. Dr. Bancroft will be happy to help you determine which reconstructive method is right for you! 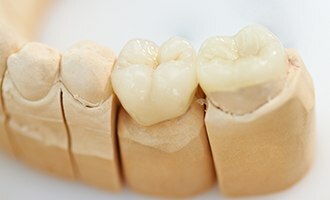 Sometimes, a patient’s tooth is too damaged to successfully support a filling but not quite severe enough to require the creation of a complete dental crown. In this “in-between” state, inlays and onlays are often an excellent compromise. Also known as partial crowns, this type of restoration is painstakingly crafted from a detailed dental impression by a trusted dental laboratory. It will be designed so that your bite and jaw still function as they did before the decay and/or injury occurred. 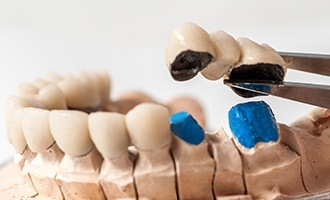 Just like traditional crowns, inlays and onlays can be crafted from metals, porcelain, or PFM. We will directly bond it to the natural dental structure. Inlays are very similar to fillings and will be placed within the cusps (tips) of the tooth, while onlays are bigger and designed to extend over one or more cusps for added support. One of the biggest benefits of inlays and onlays is that they bond directly to the tooth with an advanced, high-strength resin material. This helps increase the tooth’s remaining strength instead of reducing it, which means the new addition can last for decades. If you’re interested in exploring dental crowns, dental bridges, and inlays and onlays in greater detail with a trusted dental team, please contact our Westminster, CO practice today. J.B. Dental is happy to serve patients from all over the greater Denver area and beyond!